How Valuable is PMI-ACP Certification Part 1? The new Agile methodology was based on: 1. Iterative and incremental development, with the requirement and the solution developing with each iteration. 2. Promotion of adaptive planning and evolutionary development. 3. Promotion of rapid and flexible responses to requirements and changes. The Project management institute ​Agile Certified Practitioner​ is a professional certification offered by the Project Management Institute for Agile Practitioners. With requirements becoming complex by the days and the growth of the Agile community as an answer to it, PMI-ACP has been gaining popularity in recent years. In this article, we will discuss what has made PMI-ACP so valuable and what are the benefits that the certification can bring to you. ● There is currently a shortage of professionals who have a proper understanding of Agile methodologies and who are proficient in implementing it in real-world scenarios. 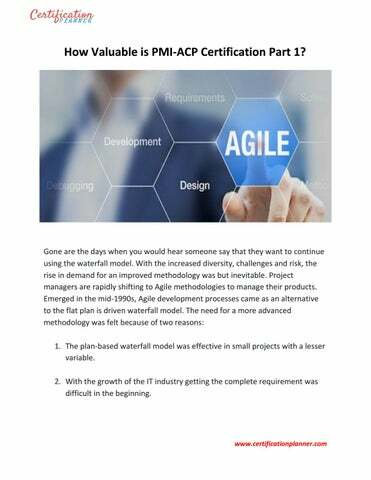 ● Along with this, several organizations have identified the qualities of Agile and have started investing heavily into it, driving the demand even further. ● Most of the companies use a blend of various Agile methodologies. As PMI-ACP covers various Agile tools like Scrum, Kanban, Lean, XP, etc. it becomes the most favorable certification in this area. ● PMI-ACP eradicates the most popular and strong point against Certification that it provides bookish knowledge by making the demonstration of actual experience with Agile a must to take up the certification. This further strengthens PMI-ACP’s case thus increasing its demand. Along with all of this, the brand name of PMI plays an important role. PMI is a global organization and is acknowledged throughout the globe. This adds weight to the PMI-ACP certification. Apart from this several surveys indicates that a PMI-ACP certified professional earns 20-30% more than his noncertified peers. 2. Wider Scope: PMI-ACP covers multiple Agile Methodologies like Scrum, Kanban, XP, etc. Different organizations use different Agile methodologies. Coupled with the increasing demand and application possibility in various business setups, this increased the scope for a PMI-ACP certified professional multiple folds. It is a well-known fact that taking up certification gives a boost to career growth. It not only validates the knowledge of a professional but also paints the growth and initiative-oriented mindset of the person. From making you stand out from the rest of your peers to making you more marketable, PMI-ACP can do all. 4. Benefits to the Organization: With a PMI-ACP certified professional, an organization gets a person who has extensive knowledge and experience in an area that is growing exponentially and has immense potential. Not just that it might just be the answer to most of the problems faced by a team during the execution of Project. All the chips falling in the correct position for the organization! While we have covered the basic benefits of PMI-ACP there is much that you should know about PMI-ACP. IN the next part of this article: ‘How Valuable is PMI-ACP Certification Part 2?’, we will put PMI-ACP course, examination process and its utility under a microscope and judge where does it stand in comparison to other project management certifications. Meanwhile, if you are confident that PMI-ACP is what you need to give your career the desired boost, we just have the thing for you. CP presents its front-of-the class PMI-ACP Certification training. We are committed to connecting the best training solutions to you. Our courseware is developed with certified instructors. That is not all, with our PMI-ACP course, you get access to complimentary PMI approved eBook, practice test, application assistance and a 100% pass guarantee. 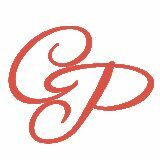 If you want to know more, contact us at ​support@certificationplanner.com​ or visit us at ​www.certificationplanner.com​. You can also call us at +1 4084185586. Happy learning! The first of the two parts Article enlists all the benefits of PMI-ACP certification, to help you discover what you can gain with PMI's Agile certification.